By now, I’m sure you’ve already heard something about this record; which is Aussie rockers Jet’s latest, and the follow up to their popular Get Born. If you didn’t see the video review that Pitchfork did, which featured a monkey drinking it’s own piss (it was actually pretty funny). Or, maybe you’re one of the many (like myself) who have read a few of the, on average, two-out-of-five star reviews that the record has received across the board to date. Whatever it is, it’s probably already seeped into your subconscious to some degree, and influenced the way you’re going to approach this album. Now, don’t at all think I’m knocking the freedom of opinion, I mean heck; Pitchfork may be a bit elitist, but I often tend to agree with them on a lot of fronts about ninety percent of the time. And, not to mention, many of the places I saw this record bashed on were peers who’s opinions I regard quite highly. But, what I’m trying to get at here is what really matters throughout all of this: And that is, of course, my opinion. I’m here to tell you friends, though Shine On probably isn’t going to win Album of the Year or anything quite that momentous, at it’s heart it really isn’t that bad of a record. It stumbles in a few spots, but I personally see it as an evolution from the potential that the band showed on Get Born, and I found it to be a fairly mature, better than expected record from a band I, to be perfectly honest, didn’t really expect nearly that much from. I honestly believe that fans of Get Born will find quite a lot to like on this release. They keep the garage rock that made them famous rolling, as showcased on the fairly enjoyable single “Put Your Money Where Your Mouth Is;” it’s just simple and rocking—and that’s all you really need. What surprised me most about this record was the Oasis-ness that it brought to the table. On Get Born they showed some tendencies that were reminiscent of the Gallagher brothers, but on this one they’re shooting for the Oasis-poseur crown. But, oddly enough, that isn’t really a bad thing. 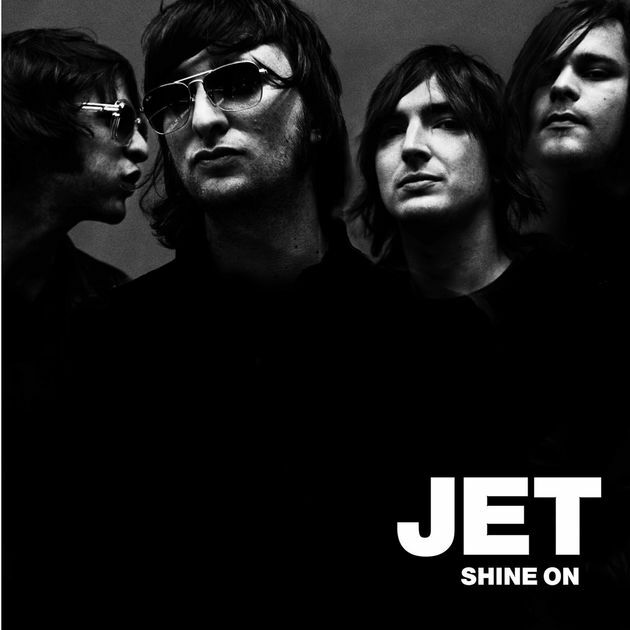 The most surprising fact I found about this record was, believe it or not; Jet actually does a pretty decent Oasis impersonation. They manage it well enough to more than carry at least half of this record, and knock out some pretty solid tunes along the way. They’re not quite as pretentious as Oasis yet, but give ‘em time my friends, give ‘em time. Clocking in at a not-so modest fifteen tracks, it does stand to argue that a bit of the fat could have been cut out around the edges, but while a few tracks may border on near-meandering at times, none of them truly strike out as “bad” altogether. Shine On is a definite step in the right direction from a band that many pigeonholed as a one hit wonder. It isn’t one of the better records out there, by no means, but it is pretty darn enjoyable. And that’s got to count for something, right?